This is such a wonderful book and it is out today. The Book of Dreams (George) – Joyce's mystery and fiction book reviews with some non-fiction too! When was the last time that you read a book and found that tears were rolling down your cheeks? For me, it has been quite a while but I cried over this one. When I told my husband about this novel, he said that it must have been depressing. I replied that it was not depressing but that it was sad. Sadness is an essential piece of this book and yet to me it was a wonderful read and one that I recommend highly, if it is your kind of book or if you are willing to see if it is. Henri, a French man with a history, is a journalist who covered wars. His thirteen year old son, Sam, did not know him. Just when they are about to meet, Henri saves a young girl but himself is injured and thereafter is in a coma. This means that Sam and Henri’s reunion takes place in the hospital where Sam, who has synesthesia, senses deeply and feels Henri’s presence. Sam spends every day at the hospital sharing himself with Henri and the novel’s other protagonists. This book is the story of several characters: Sam, Madelyn who is a young girl in a coma and Eddie, the woman that Henri let get away. Their relationships are explored and intersect with one another over the course of the novel which is told in alternating voices. There is a philosophical underpinning to this book. The characters both live their lives and imagine the ways in which their lives might have played out differently with the same people. The author also explores what she imagines that characters think and feel when they are in a non-awake state and what happens when someone is about to die. Nina George comments that she wrote three of her novels, of which this is the third, to better understand death. She was writing in the aftermath of her father’s death. The book is beautifully written. 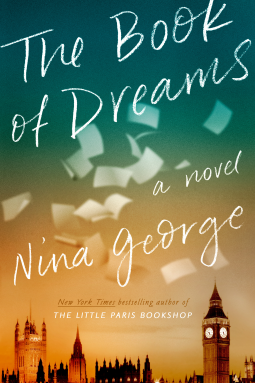 I very much enjoyed this author’s novel, The Little Paris Bookshop and feel that The Book of Dreams is also a keeper. For me, it is a five star novel. Many thanks to the publisher and NetGalley for a moving and wonderful read. The opinions are my own.